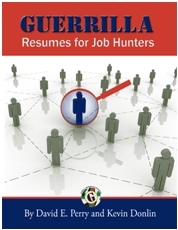 Guerrilla Job Hunting - Job hunting phrases and what they really mean. You’re on your own. Remember that old saying “sink or swim”. Here’s where the rubber really meets the road cause your on your own baby! Go to Google and run a search with the name of the company as well as the word resume. This will return the resumes of people who used to work at the firm. Call them up and ask them what it’s like to work there.